John Townsend has agreed to guest post, expanding the discussion about book conservation education. John truly needs no introduction; simply put, he is a leader in our field. 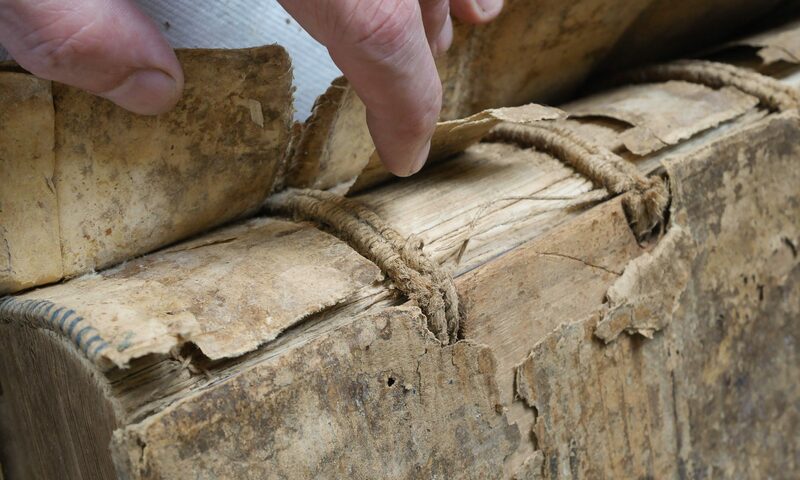 I’m thrilled he has written this piece–sharing stories about his education, providing philosophic reflections on the ontological status of the book and speculating about the future of book conservation education. John Townsend owns and operates Anonymous Bookbinder, a small hand-bookbinding and conservation workshop in upstate New York. Most recently active in information technology, digital information access and related fields, he is also a librarian with a broad background and extensive experience in conservation and preservation, and he has been a bookbinder for over thirty years. He began his professional career as head of the Conservation Lab at the New York Public Library after graduating in the first class of Columbia University’s Library Conservation and Preservation Program. He has also served as head of the NY State Conservation/Preservation Program, and as a preservation planning and evaluation consultant for SOLINET, the Northeast Document Conservation Center (NEDCC), the National Library of Indonesia, the World Bank Global Environmental Facility, and for many other organizations and institutions. Immediately prior to starting Anonymous Bookbinder he was executive director of the New York State Higher Education Initiative. I read Jeff’s recent blog post on US/UK education, etc. and thought it right on target, or “spot on” as they say over there. And I think he pretty much captured my feeling about where we are all headed, but want to expand upon his thoughts and explore some other issues. My Columbia University education was perhaps unique because I was headed for the conservator’s bench before I arrived, but ultimately came out on the administrator side of the program. Columbia was my fifth year of graduate school, which is four too many for any sane person, so the administrative program made sense to me. By then I had done the usual 70’s thing of picking up what I could when and where in terms of craft skills, including a vastly informative but functionally useless stint at a commercial bindery. I already had a library degree as well, which meant that much of what happened academically on the conservator side of the Columbia program would have been redundant, at least as it was structured at the time—it has evolved considerably. I really wanted a third year internship, but Paul Banks was not willing to consider it. Before Columbia came along, I considered staying in DC for an internship with Frank Mowery & Karen Garlick at the Folger, but my DC teachers–Merrily Smith,a paper conservator and Newberry protege of Paul’s, along with Tom Albro and Robert Espinosa–urged me to at least do the administrator program for the credentials and then decide. For once I took good advice when it was offered. It turned out better than I expected since all of us (administrator and conservators students) did labs together with Gary Frost that first year and he was amenable to letting me pretty much live there. He also let me live for a while in his apartment the following summer while he was away and I was waiting for a job, and he left me a key to the lab so I could use it whenever I wanted, which was all the time. Lynn Jones and I were also working for the Columbia Library part time on an NEH preservation project encapsulating brittle books–pre-Minter welder. The NYPL job followed that, which was pretty much the only book conservation job available anywhere at the time, although more jobs were quickly created. So, I was extremely lucky in my pre-Columbia experience and what I managed to squeeze out of Paul and Gary while there. As far as I know, no other student in the administrator program managed anything quite like it. My thoughts on the state of things now and the future education of conservators are obviously colored by all this, as well as by my time at NYPL and my subsequent time “on the dark side” (the IT and digital side) as George Farr used to call it. Jeff is correct, I think, in saying that the shift in book conservation education mirrors the change in the social role of books. I remember very clearly pondering long and hard about the book question when NYPL was preparing for the transition to its online catalog. Online catalogs had been around for a good while by then, but it was also at the time that the personal computer was taking off and many of us were beginning to see where the creation, storage and means of accessing information were headed. It was always clear to me (or so I thought) that the book (codex) would be around for a very long time, but I was also certain that this was separate from the question of how we access information. Not “separated by necessity”, but that they could be separated and were on the verge of being separated in practice. I was also reading–and ultimately becoming disgusted with–Heidegger on the question of technology at the time, which is probably neither here nor there, but it seemed relevant at the time. Just before going to Columbia I had read E. Eisenstein’s “The Printing Press as an Agent of Change.” I found it tedious in the extreme, but in terms of the social role of the book she is dead right, and what she says applies equally well to the rise of digital information. Specifically, she says that the advent of the printing press changed forever the way we managed the collection, dissemination, standardization, organization, and preservation of information. Any success I had on “the dark side” came from understanding that this is precisely where we stood with the digital revolution–it was going to change exactly these same things, and change them as fundamentally and profoundly as had the printing press. So where does that leave the book and book conservation? I believe the codex remains a viable and extremely useful technology, bastardized though it is in its current incarnation, and that it is likely to persist in common use for a very long time, even if books no longer serve as the primary vehicles for the collection, dissemination, standardization, organization, and preservation of information. I don’t believe they have ceased these functions yet, and I’m not sure I will live to see it, but it is possible to conceive of. And possibly the nagging problems of digital preservation and access will someday be resolved. If and when that happens I also believe that collections of books (codices) will take on a new value and the need, the desire and cultural urge to preserve them can only increase. This is a still nascent thought and I’m not sure where it will end up, but for now it suggests to me a “museum” function, where books are preserved as artifacts but—just as in a well run “special collection” in a library–with an acknowledgment that the value of the codex cannot be isolated from its functional aspects. That is, the codex is not a static entity–physically or intellectually–and it must be used/useful/useable in some way in order to maintain its value. Otherwise it is simply an “object” taking up space and collecting dust. If this imagined “museum function” for collections of books–or something like it–does come about, then the role of the book conservator may perhaps become even more similar to the role of the museum conservator. But I hope not–there is no need for a “book” conservator if the book becomes an object only and it functional aspects embalmed or ignored. To reply directly to one of the questions Jeff raised, the preservation of the craft skills of bookbinding must–absolutely–be preserved as an essential part of the training of a book conservator–even including how to cut paper with scissors (I loved that!). I have often thought that too much effort has gone into trying to make book conservators like their art conservator counterparts. I think it was a matter of prestige more than anything, and may have been necessary in its time to legitimize and establish the profession, but I think in some ways it exacerbated the loss of what little remained of the craft/trade bookbinding skills the US. There wasn’t a lot left by the 70’s when I was first seeking it out (or not much I could get to). The tradition and skills here were never as robust as in the UK and Germany, but much of what there was we let slip away while we were focused on “higher” learning. This is not to say that book conservators should not be trained as thoroughly as art conservators–they should–but they should also be trained as bookbinders. If the “museum function” I think I foresee for book collections does emerge, then such training will be essential. Alas, with our tradition (such as it was) gone and with the UK and German traditional craft beginning to fade–albeit with a very lively and vital heritage still in evidence– the question of how to preserve and transmit craft skills is just as troublesome now as it was to me in the 70’s. I was Camberwell-bound before I decided to first get library school behind me and take advantage of what I could find in DC. Ironically, I would probably be in the same position if I were starting from the same place today, although I expect I’d give North Bennet Street School or American Academy of Bookbinding a try before heading overseas. There are certainly more opportunities for study in the US now, but for the most part they are even further removed for the tradition of craft skills–notable exceptions notwithstanding, including the AAB and most anything else Don Etherington is associated with. Like Jeff mentioned in the previous post, I am afraid too many of these skills have gotten away from us before we have figured out how to preserve them. So recovering these skills is perhaps all we can hope for–digging them out of old books, out of old-timers, and in many cases reinventing them. And, of course, passing them on in whatever venue presents itself–in writing, by demonstration–whatever (reality show, perhaps?!). I am somewhat surprised that I have come to think that the much maligned workshop will prove to be the most durable vehicle for transmitting key aspects of the craft. Many of the brickbats hurled at resumes laden with workshop-only experience are, I think, really intended to signal that workshops do not equal skill or proficiency. Of course they don’t–only repetition and experience and some natural ability can build skill. But as a vehicle for delivering information about a craft, workshops work exceeding well. Better, I expect than the old apprenticeship where the first two years were spent doing nothing but sweeping and fetching for the guy who only wanted to make sure you were as miserable as he was when he was doing it. And other than workshops, what else do we have? Unrelated to bookbinding, I learned timber-framing in a one week workshop them managed to gain some measure of skill when I used that information to put up a shop building at our home site, and went on to become a fairly accomplished framer (if I do say so) while building a house which still stands and where I still live almost 20 years later. It’s also solar powered—same drill: one week workshop, to trial photovoltaic system in the shop, to fully functional system in the house. I do not believe it is reasonable to assume that bookbinding is any more complex, or that the basic skill set cannot also be acquired in a similar manner. And if book conservator training programs as we have known since the 80’s go away, then what choices do we have? The UK may be good for a while (a long while I expect), and NBSS, AAB and the like will probably be viable sources of conservation training for a while longer, although even now they seem mainly supported by the bookbinding/ book arts community. But if the cause of the demise of training is an underlying social change in the collection, dissemination, standardization, organization and preservation of information, then the tradition out of which book conservation grew will become more and more remote, and the skills more rarefied. The transmission of the craft will then have to rely on the desire and the urge of those who know– and I mean “those who know” (really know) not just those who are fascinated and think they know–it will rely on their willingness to pass on what they know to the few who are interested and willing to commit to learning it. An ancient model, to be sure, but perhaps the only thing that has ever really worked for the parts of what we do that are dependent on craft. So the old workshop, seminar, “intensive,” or whatever they are called seems to me the most likely way to insure that the knowledge and the craft that needs to persist, will persist, and that as a result the codex–however unusual it becomes–will also persist as a functional object. Of course I am probably wrong about everything–I would be surprised if it were otherwise–but it is not possible to think about such things without speculating once in a while about what they mean and where we are headed. Perhaps the next time I reflect upon them, I will think differently. Or not. I suspect these two sentences will stay with me for the rest of my life. Thanks so much for adding your insight on conservation education. I am desperate for these conversations because I am looking for a conservation education, and not terribly sure where to find one. I’ve heard that employers are wanting conservators with library degrees and graduate conservation degrees, which is a large part of why Kilgarlin seemed, to me, like a magic bullet of sorts (even though a longer term of hands on study seems to make sense. In lusting after internships (it’s lust because I am nowhere near ready to apply for one), I also see a lot of them requiring that you are a conservation graduate student, which begs the question (in my mind at least), “where?” If not Kilgarlin, where do they think I will be a graduate student in book conservation? I feel a bit late to the party or something. I have spent a lot of time looking at CVs of conservators and Kilgarlin students, to get an idea of where they took their first steps toward conservation, but I have no idea how they are getting these gigs (they all seem to be on the internship-type-activity level, but without internship-like prerequisites). Luck? Several even earlier steps that don’t make it to the CV? For the time being, I am trying to take a workshop or more a year, practicing what I learn there at home, and visiting conservators when I can, while working fulltime and living at home to try to pay off student loans. I’ve thought about trying to find, and possibly relocate for, any whatever job in a bindery or conservation lab. But, I’m not finding anything suitable (the economy doesn’t help, I’m sure) and my crippling load of student debt means I have to have high standards for pay (living at home, I pay no rent, so relocating means I need to make at least what I make now, which isn’t much, plus enough for rent/utilities/food). If anyone has any thoughts on this, I would love you forever.